A Summer Breeze can come along at the most needed time to refresh and restore your summer-soul! I can relate to my fellow blogger Karen’s latest blog about having the summertime blues (click here). It hasn’t exactly been the summer of my dreams either. There are, in fact, several songs written about experiencing a sad summer! Karen’s thoughts reminded me a lot of having “the blues” around holidays – especially noteworthy in that regard is Christmas. We have a lot of expectations about Christmastime, and put an enormous amount of pressure on ourselves to make it “perfect” for us and our families, and rarely is it ever like in the movies. Summer is the same way. We expect that we will simply end the school year, or enter the slower work season, with an automatic transition to s—l—o—w. We expect that we will be healthy and happy as we frolic in the sun at the beautiful beach-side condo we saved all year to rent. We expect that in those two or three warmer months of bright sunshine and clear skies, we will find calm, peace, and – well, Zen. The reality is, however, that life is still just that: Life (with a capital ‘L’). And just because we expect it to slow down doesn’t mean it will. So, what is one’s option for “getting away from it all” when, at the end of the summer day, you simply can’t? Recently, I found one answer to this question lies in…. True Zen CAN be yours this summer! This idea came to me as I was experiencing yet another rather hectic summer morning. It was the usual a.m. routine: I’m startled awake by my young son at my bedside, up and ready to go (too ready to go); I feed my child, feed my dog and barely feed myself; and then dash my little guy off to a full day of fun-in-the-sun at camp. When I’m not in the midst of all this, I wonder why it is that I can never seem to get it all done – my son is away all day. However, a big job called “Too Much” always stares me down the moment I walk through the door after camp drop-off and I never win the staring contest. I’m not quite sure how other women seem to find the time for that relaxing cup of coffee on their flower-pot-filled deck before it gets too hot, but that simply just doesn’t exist in my world! This morning, however, I decided to outwit Too Much. So when I parked my car in the driveway and got out, I headed straight for the rustic walking path my husband created and which winds around the hilly perimeter of our 2 ½ acre property. I needed these woods today – along with the peace, quiet, and serenity they bring. 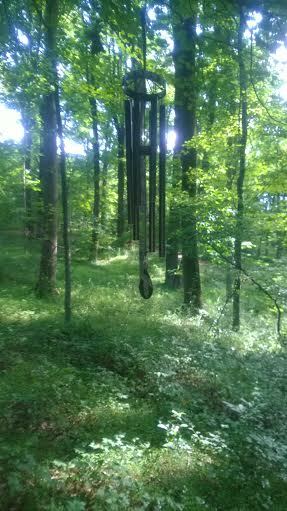 As I strolled the wood chip laden path, I noticed the wind chimes my husband had hung on tree branches along the way. They have been present along the path for some time, yet for some reason this morning I was more “in tune” with them. 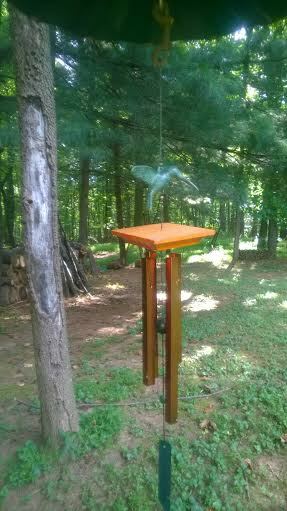 Have you tinkled your wind chime today? As I walked by, I reached up and gently touched the chimes. With each of the wind chimes, I listened to the different sounds the silver, rounded-end bars made as they knocked back and forth along one another – focusing on the quiet, subtle tinkling of one wind chime and the hollow bonging of another. Sometimes I would let the sound die out and the chimes stop moving before I walked on which forced me to be still for a while. During one of my laps around, I even stopped in front of each chime; and either whispered a prayer for someone or for myself, or offered a petition that reflected a need I had been holding in my heart. Besides helping me to find some calm within before returning to my house to face Too Much, our wind chimes looked – and sounded – so beautiful, especially when a Summer Breeze came along. I had finally found my summertime Zen! Have you been in need of some inner peace this summer? Why not take a simple walk and let us know what you saw, heard, or even touched that brought some sunshine to your world – we would love to hear from you! How to Catch Your Breath and Recharge! 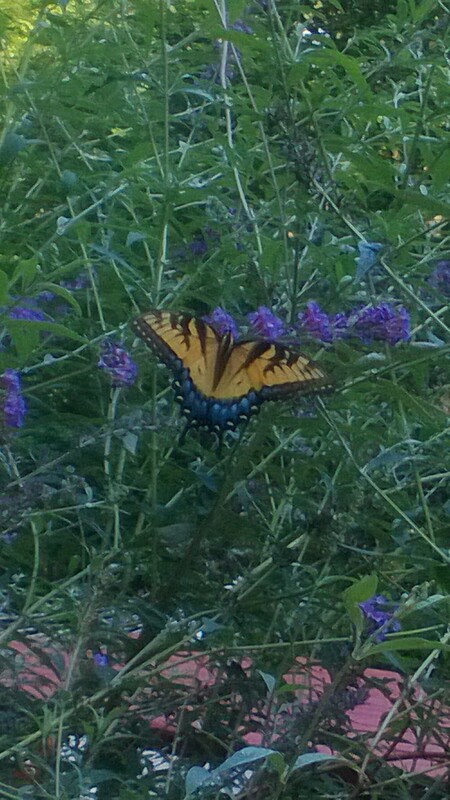 A beautiful butterfly showing off just for me! As I recover from my third surgery in 2 ½ years and try to regain some semblance of my former self, I find I also need to get back to my writing work, catch up on household projects, and say goodbye to my “baby” as he begins preschool this fall. In the midst of all of this, my inner voice is shouting at myself to get going and I can’t seem to turn it off. It is certainly time to recharge! In a few of my blogs I have an underlying theme of how “little things” really matter. So, I have decided to listen to my own advice and start making the time to plug into those little visions, little words, little moments, little happenings. With sweet summertime coming to an end, and the fall getting underway, I encourage you to take a little time to do the same. All it really takes is about 10 minutes to let go of some of the stress you are dealing with, catch a breath of fresh air, and simply take in your environment – all while gaining a little more peace, sanity, and optimism. Here’s what I suggest. Right now … yes, right now get up from wherever you are (and hopefully you’re not in the middle of a board meeting) and simply walk outside. And then? Keep walking! As you walk, take several deep breaths in and exhale them, rolling your shoulders back and down. Now that you have literally caught your breath and stood upright, just stroll around – your yard, your neighborhood, the sidewalk block or parking lot in front of your work building. For 10 minutes. Keep in mind that this is not a workout and you should not be breathing hard when you finish. This is only meant to be a quiet, peaceful walk to silence your overcharged, busy mind and think on … the little things. They really are most important in this world! Woah! Settle down, Charlotte – your enormous web outside my kitchen window just keeps growing! Look at these little lovely flowers growing by the lamp post – easy to just walk by and not give a second thought until you stop long enough to do so. Hey – there’s a pig in my garden! And a toad in the bushes! 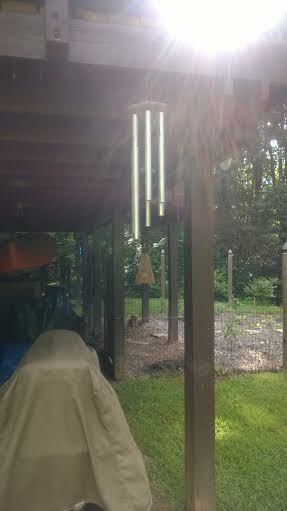 With just a slight breeze, our wind chimes make a lovely bell sound. My son is fascinated by bees, so we put a stained glass one on his bedroom window – so fun to view from the outside. Ahhh … wide open spaces! Lovely new flowers blooming on our backyard tree. Amazing what you see when you slow down, stop, and … LOOK UP! Please share how you are recharging your body, mind, and spirit as the fall season begins. What are some things you saw on a short, meditative walk? Or, did you find another way to bring sanity to your world? We look forward to hearing from you!